This was January 2010 in Dublin. I was having a meeting with a very nice man who was to be my coordinator at the Mentor Network that works with Enterprise Ireland to assist companies in their development. I should hasten to add that he thought they were a priority, but ‘they’ didn’t and he was just passing it on for my information. Enterprise Ireland represents part of the Irish government’s efforts to re-boot the economy. Of course, all political parties, when they are trying to get elected, are acutely aware of the importance of image and identity in their campaign, yet it doesn’t seem to be a priority for fledgling companies. Since when has making a good first impression not been important? And when has it not been important to develop a strong relationship based on good impressions supported by positive values? The truth is that we have always been hugely influenced by images and messages. They form the bulk of our guidance system through life, but they are often subliminal. 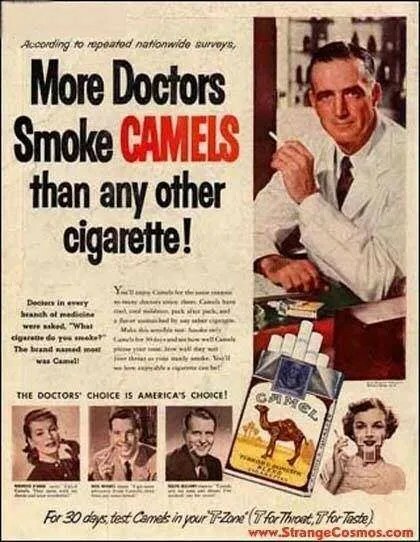 If we look back at old advertising, we may find some of it funny, distasteful and even ridiculous – but we may not have questioned it at the time. The factors involved in our acceptance of images and messages are far too extensive to discuss in a short blog like this, but they are very real, and companies ignore them at their peril. As they say, change is the only thing that we can be certain of, so we would benefit from seeing all our business communications as a constantly evolving process and paying close attention to them. Take a look at the images here, and imagine where these companies would be now, if they hadn’t changed their imagery and messaging! 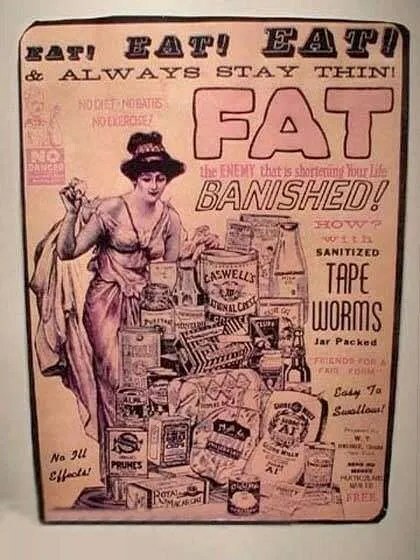 I also found a wonderful ‘have your cake and eat it’ ad, suggesting that you could eat as much as you like and not get fat by taking sanitized tape worms as part of your diet. ‘FAT – the ENEMY that is shortening Your Life – BANISHED!’ Don’t worry, apparently they are ‘easy to swallow’ and have ‘no ill effects’. 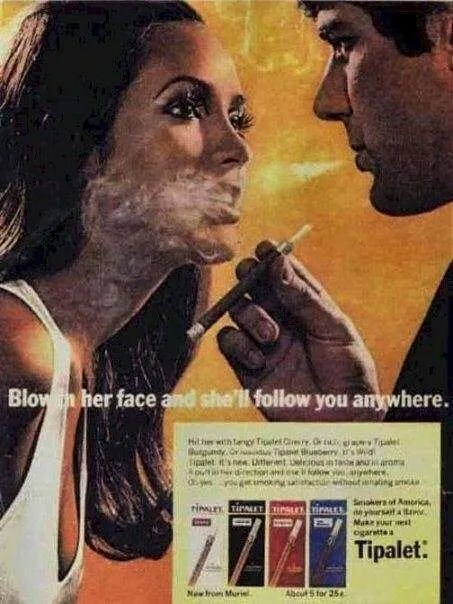 It seems laughable now that such an advertisement could even exist. 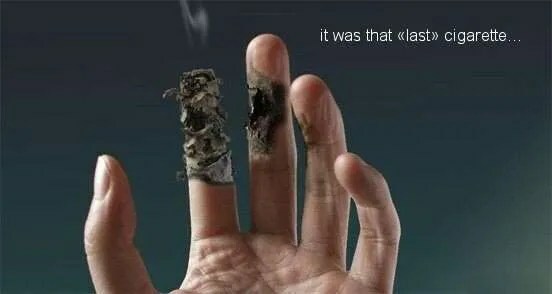 I wonder if we will feel the same about tobacco advertising in our lifetime. The right corporate identity and image are key to success. Gaffes are frequently made, but those who take them seriously can get them right and they help them to prosper. Apart from many other valuable considerations, they clear the pathway to meaningful relationships by accurately and authentically letting people know who they are. One of the challenges is to make the identity future-proof. If a company relies too heavily on focus groups and existing research to define the message they want to put over, they run the risk of being absolutely right for now, but quickly becoming obsolete. If they go too far into the future and unknown territory with advanced thinking, they can alienate current customers and find it very difficult to get board approval. BP had to manage a lot of criticism when, in 2000, they changed from their familiar shield logo to the sunflower. The criticism that erupted covered a vast gamut of snipes. Marcello Minale, a top corporate identity man in London at the time, famously described it as an infantile spirograph drawing (I guess his pitch was one that failed). It was likened to the Flora margarine logo, it was panned as a disingenuous attempt to make the business of burning oil appear to be green and clean; but the logo stood and became accepted. Many companies would be just too scared to go there, but good planning and clear thinking paid dividends in their case. Back to my meeting. Along with the comment about corporate identity and image came a folder. The first thing I noticed when I opened it was the picture (below). An idealized start-up situation. It looks very much like a stock shot to me, and the symbolism is really laid on thick. The mentor is suitably older but not doddery with a touch of grey to show experience and an informal posture to suggest connection and involvement. He’s wearing a blue shirt – the colour of safety and security. The young, clean-shaven bright-eyed businessman-to-be is leaning earnestly in to eagerly catch every last drop of wisdom as they both sit in an unfinished yet pristine office. Nothing wrong with any of that, but you can’t deny it’s there, and it’s meant to impress the reader and give them confidence in the organization. In other words, the very organization that was side-lining the issue of image and message was trying to use it for themselves. Of course they are. The rest of the design and text was clean, neat and uneventful. It was depressing in that it was exactly as I expected it would be. I didn’t really want to read it, and felt it would be a chore to search through it for any relevant, important or exciting information. When I did read it, the parts that impressed me were the impassioned testimonials of people who had benefitted from the mentoring process. I greatly enjoyed my meeting with a charming, professional and very likeable person, but in summing it up, I had a realization. Ironically, the stumbling block in the whole process was the printed material that was supposed to be designed to give me a good impression of the organization. I guess the reasons that it didn’t are clear from the comment I opened with, but this is something that happens a lot. So often our interactions with people are confused by clumsy or uninspired material that adds nothing to the experience, and can even get in the way. Having said that, the fact they are produced at all reveals some truths about the organization or business that creates them. The messages may be as subliminal to the producer as they are to the recipient, but they are not without effect.